Born in Santa Monica, California, Quisenberry played at Costa Mesa High School, graduating in 1971. He then went to Orange Coast College and then onto Division III University of La Verne in La Verne, California. 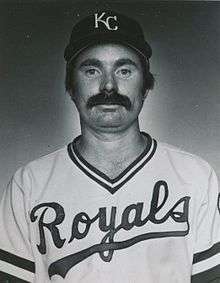 He went on to sign with the Royals as an amateur free agent in 1975, and was considered a marginal prospect. At the age of 26, he made his major league debut with the Kansas City Royals on July 8, 1979 against the Chicago White Sox, pitching 2⅔ scoreless innings, and surrendering just two hits and no walks. Quisenberry finished the season having appeared in 32 games and posting a 3-2 record with a 3.15 earned run average and 5 saves. During spring training the following year, manager Jim Frey suggested that Quisenberry learn the submarine style delivery from Pittsburgh Pirates reliever Kent Tekulve to confuse hitters, because he could not overpower them with a fastball. From 1980 to 1985, Quisenberry was the American League's dominant closer leading the American League in saves all six season (with the exception of the strike-shortened 1981 season). During that same span, he posted an ERA of 2.45 and won the Rolaids Relief Man Award each season. He also finished in the top five in voting for the Cy Young Award during this span. Quisenberry was hardly the prototypical closing pitcher. Unlike many of his peers, he didn't possess a hard fastball, and thus had to rely on pinpoint control, guile, and deception, which was augmented by the submarine delivery he first used in 1980. His primary pitch was a sinking fastball, which causes hitters to hit the ball on the ground rather than in the air. He also possessed a curveball in his repertoire, as well as a changeup he developed in 1984 and an occasional knuckleball. Although Quisenberry was not a strikeout pitcher, he offset this deficiency by seldom walking batters or throwing wild pitches. His 45 saves in 1983 was briefly a single season record (tied in 1984 by Bruce Sutter and broken in 1986 by Dave Righetti). Quisenberry was the first pitcher in major league history to save more than 40 games in a season twice in his career. He won a World Series with the Royals in 1985 and was the winning pitcher of Game 6, notorious for Don Denkinger's blown call at first base. In 1983, the Royals signed Quisenberry to a lifetime contract, similar to the contract of his teammate, George Brett. However, a rocky start in 1988 led to Quisenberry's relegation to middle relief and mop-up duty. Shortly before the 1988 All-Star break, Quisenberry was released by the Royals. Ten days later the St. Louis Cardinals, managed by ex-Royals manager Whitey Herzog, signed Quisenberry as a free agent. After pitching for a year and a half in St. Louis, Quisenberry signed to play the 1990 season with the San Francisco Giants. Quisenberry tore his rotator cuff just five appearances into the 1990 season, and was faced with serious injury for the first time in his career. At the age of 37, after 12 seasons in the majors, Quisenberry retired. In the 1996 Hall of Fame Balloting by the Baseball Writers' Association of America, Quisenberry received 18 votes, just under the 24 vote (5%) cut-off to remain on the ballot. In the same election, Bruce Sutter – a pitcher with remarkably similar overall statistics – received 137 votes; he went on to be elected to the Hall of Fame in 2006. In 2013, Quisenberry's Hall of Fame candidacy was given a second look by the HOF Expansion Era Committee, which reexamines the credentials of overlooked players from 1973–present. He fell short of the 12 votes needed from the 16-member panel, while former MLB managers Tony La Russa, Joe Torre and Bobby Cox were voted into Cooperstown for the 2014 class. Quisenberry will have another chance with the voters when the Expansion Era Committee next convenes in 2016. Along with Sutter and Rich Gossage, he was at the forefront of the transition from relief ace to the La Russian ninth inning closer. Quisenberry's Adjusted ERA+ of 146 ties him for third all-time among qualifying pitchers. His career rate of walks per 9 innings pitched is the lowest since 1926. In addition, Quisenberry accrued the 22nd most all-time Cy Young shares. After his baseball career ended, Quisenberry embarked on a second career as a poet, publishing three poems in 1995 and a book of poetry titled On Days Like This in 1998. He also emerged as one of baseball's most quotable characters, with bon mots like "I found a delivery in my flaw" and "I've seen the future and it's much like the present, only longer.". At least the latter quote, however, had been published verbatim nearly two decades prior, in the satirical collection of poems "The Profit", written under the pseudonym Kehlog Albran. In January 1998, Quisenberry was diagnosed with grade IV astrocytoma, a highly malignant form of brain cancer. He died in 1998 in Leawood, Kansas. 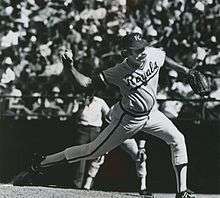 In 1987, Quisenberry and Gene Garber tied for the Royals' team lead with 8 saves apiece; this ranks as the fewest for a team leader in Royals' history. He held the AL record for career saves from 1987, when he surpassed Fingers' mark of 233, until 1992, when his AL total of 238 was broken by Jeff Reardon. He was the first pitcher to record 40 saves in a season, doing so with 45 in 1983, and followed with 44 saves in 1984. He was the only pitcher to earn 40 saves twice until Reardon did so in 1988. Famous for his pitching control, Quisenberry surrendered only 11 walks in 1983 and 12 in 1984, in over 268 combined innings pitched, and was runnerup for the AL Cy Young Award in both seasons. Quisenberry was the only pitcher to appear in every game of the 1980 World Series. ↑ The Neyer/James Guide to Pitchers: An Historical Compendium of Pitching,Pitchers, and Pitches. Bill James and Rob Neyer. 2004. ↑ "Dan Quisenberry not picked by Hall of Fame committee",The Kansas City Star. ↑ "Career Leaders & Records for Adjusted ERA+", Baseball-Reference.com. Accessed July 25, 2007. ↑ "Career Leaders & Records for Bases on Balls/9IP", Baseball-Reference.com. Accessed July 25, 2007. ↑ "MVP and CY Young Award Share Leaders", Baseball-Reference.com. Accessed July 25, 2007. ↑ Henderson, Heather (1999). "Dan Quisenberry – In His Own Words". The 1999 Big Bad Baseball Annual. Retrieved June 24, 2013.